Finally - there will be an Etsy update for a batch of xoxoBlythe knitted tunic tops this Wednesday, July 29th at 5:30pm PST! That works out to be 8:30pm EST, Thursday July 30th 1:30am GMT, and 10:30am Australian time. I know it's not very EU-friendly, so there will be a 2nd batch this weekend that will be more convenient for our friends in the EU. Please stay tuned! The girls all dressed up for the meet! 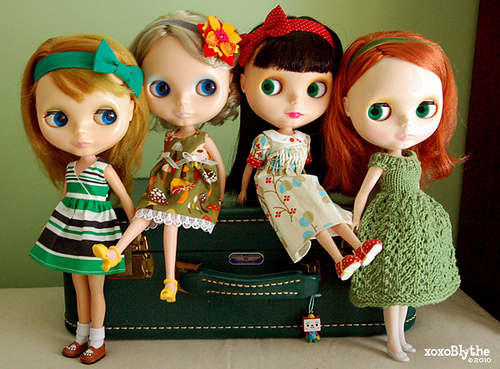 Left to right: Noe, wearing headband by Rob & Sioux and dress by Xie Kitchen, shoes by Princess Sara; Emma, wearing headband by Cristel, dress by Fishknees, shoes from Mattel; Paige, wearing headband by Rob & Sioux, dress by me, shoes from Volks; Reese, wearing headband & dress by me, and vintage shoes. 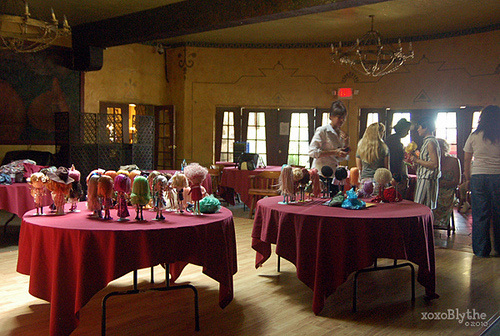 We had such a great time at the July Blythe Meet last Saturday! It was so nice to see our Blythe friends as well as meeting some new faces. We had our meet at the Aztec Hotel in Monrovia, the same venue as the meet in May, except this time we had a room indoors. Thanks Penny/Blythegalaxy and Fiddy for organizing! The weather was so perfect in May, but it was a scorching 100F/37C on Saturday! On top of that, the air conditioning wasn't working inside, so we all tried the best we could to keep cool and drink lots of liquids while admiring all the dollies before us. It was an especially nice meet because we got to meet Gayle/Shadow Planet who was visiting from the midwest! We have been admiring Gayle's dollies and her work on Flickr for some years now, so it was wonderful to finally meet her in person! We had a fun gift swap too - I really wanted to participate so I made a dress and matching headband on Friday night (good thing the meet was on a Saturday so I was able to stay up!). The theme was "Welcome to Hollywood," so I tried to make a set that would look great on a Hollywood Blythe, of course. Shades of cream, with neutrals like brown, gray, and olive green. And guess who ended up with my set - Fiddy! I hope her Hollywood will like it!